To learn more and give input on the project please come to the Public Workshop scheduled for April 24th, 6:30 pm at the Emeryville Center for Community Life, 4727 San Pablo Avenue, Emeryville CA 94608. If you cannot attend but want to provide input, please fill out an ACTC Survey. For more information, download the fact sheet or visit the ACTC website. For additional information, including a link to Councilmember Kalb’s initial Budget Priorities Memo, the Mayor’s proposed budget when available, other budget-related documents and a more comprehensive list of the budget process deadlines, please visit the Council District One Budget page. If you are unable to attend and would like to provide input to Councilmember Kalb regarding what you would like to see prioritized in the upcoming two-year budget, please e-mail Oliver Luby at oluby@oaklandca.gov with “19-21 City Budget” in the Subject line. Councilmember Kalb's office has Community Office Hours each month at rotating North Oakland cafés. District One resident can sign up for a 20-minute slot by emailing Lisa Jacobs at ljacobs@oaklandca.gov or calling 510-238-7014. Feel free to include the topic of your inquiry or issue when you reserve a spot. Thank you! Learn about the Oakland Department of Transportation's (OakDOT) proposed 2020-22 Oakland Paving Plan. The plan is being shared with the community prior to its presentation to City Council. At the meeting OakDOT staff will explain the process it undertook to prioritize among the many streets in Oakland that are in need of repair. If you cannot make either meeting and/or want more information in advance of the meeting please see the Paving Plan webpage. And feel free to download the flyer and share with your neighbors. Please see the event flier here. The federal government distributes Community Development Block Grant (CDBG) funds to cities for their local community development projects to promote viable urban communities, principally for persons of lower income. The City of Oakland distributes these funds through Oakland's CDBG program, which incorporates public participation, including through CDBG district boards. Councilmember Dan Kalb will be holding a meeting for residents in the North Oakland CDBG area to provide public participation information about the 2017 North Oakland CDBG process and to elect Board Members. To appear on a printed ballot at the January 21st meeting, a nominee must (1) be nominated by Councilmember Kalb and the D1 CDBG Board Officers or (2) file an electronic nomination form no later than 5:00 pm on January 11, 2019. Nomination forms can be filled out here. 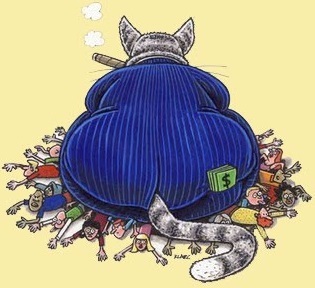 Low income residents are highly encouraged to be nominees for the D1 CDBG Board. The full meeting notice and agenda is available here. Please join Councilmember Dan Kalb and his staff for the annual District 1 picnic on Sunday, July 29th. We will provide the main BBQ dishes and drinks. Feel free to bring a side dish or dessert to share. Click here for Event flier. Please join Councilmember Dan Kalb for a Town Hall meeting on Monday, May 21st to discuss the homelessness crisis in Oakland. Learn more about what we know and what we are doing to address this issue. Guest speakers will be in attendance to answer any questions. Please join me, Chief Anne Kirkpatrick, the Mayor’s Director of Public Safety Venus Johnson, and Area 2 Police Captain Jake Bassett for a Community Town Hall Meeting. This Community Meeting will be held on Thursday, October 5th at the North Oakland Senior Center, 5714 Martin Luther King Jr. Way, 7:00pm - 8:45pm. This meeting is open to anyone who lives or works in Oakland. Thank you for your continuing commitment to our good city. Hope to see you there. This year, once again, we are looking forward to providing great space for the District One community to connect in a casual and relaxing atmosphere in one of the most beautiful parks in Oakland. Please join us and invite your neighbors and friends! Mayor Libby Schaaf just released her proposed 2017-19 Budget for our city. The City of Oakland’s two-year budget process will continue to be a major focus for Councilmember Kalb and all of City Hall through the end of June. Councilmember Kalb’s initial Budget Priorities Memo for the City’s General Purpose Fund is available here. No later than three days prior to final budget adoption – Council Budget Amendments. Special Council meeting on the Budget (Oakland City Hall - Council Chambers) is scheduled for Tuesday, May 30th at 5:00pm. Councilmembers will have challenging choices to make for the upcoming budget. If you have input for Councilmember Kalb regarding what you would like to see prioritized in the upcoming two-year budget, please e-mail Oliver Luby at oluby@oaklandnet.com with “17-19 City Budget” in the Subject line. For additional information, including a link to the Mayor’s proposed budget, other budget-related documents and a more comprehensive list of the budget process deadlines, please visit Council District One Budget page here. North Oakland community members will have the opportunity to help decide on how to spend $227,308 in federal Community Development Block Grant (CDBG) funding, which will benefit lower income communities in North Oakland. All residents in the CDBG-eligible neighborhoods (Golden Gate, Bushrod, Santa Fe, Longfellow, Mosswood and a portion of Temescal) are welcome and encouraged to attend, meet you neighbors and cast a vote (regardless of age or citizenship status). Refreshments, music and activities for kids will be provided. Greetings everyone. This Saturday is a unique opportunity for residents of the Bushrod, Golden Gate, Longfellow, Mosswood, and Sante Fee neighborhoods, as well as a small portion of the Temescal, to weigh-in on how to expend Community Development Block Grant (CDBG) federal funds slated for improving low-moderate income communities in North Oakland. The gathering this Saturday afternoon will focus on idea collection and priority setting. Our goal is to hear from as many community members as possible who live in the eligible neighborhoods. Please attend and bring a neighbor as well. Here is a flyer for the event. Here is the Facebook page for the event. If you cannot make this event but would still like to offer your thoughts on how these funds should be spent, please visit pboakland.org. Here is a map of the District 1 CDBG area. Councilmember Dan Kalb will be holding a meeting for residents in the North Oakland CDBG area to provide public participation information about the 2017 North Oakland CDBG process and to elect Board Members. To appear on a printed ballot at the January 21st meeting, a nominee must (1) be nominated by Councilmember Kalb and the D1 CDBG Board Officers or (2) file an electronic nomination form no later than January 19, 2017. Nomination forms can be filled out here. Save the date: January 28, 2017, 1-3 pm, Beebe Memorial Cathedral, District 1 CDBG Participatory Budgeting Town Hall General Assembly. MacArthur BART Station Parcel B Project Update! Please join Councilmember Kalb, the Planning Department Staff and the Project Developer for an update on the MacArthur Bart Station Parcel B Project. To see the event flier please click here. Sunday, July 24th, Noon- 3 pm at Charles Porter Golden Gate Recreation Center at 1075 62nd Street. 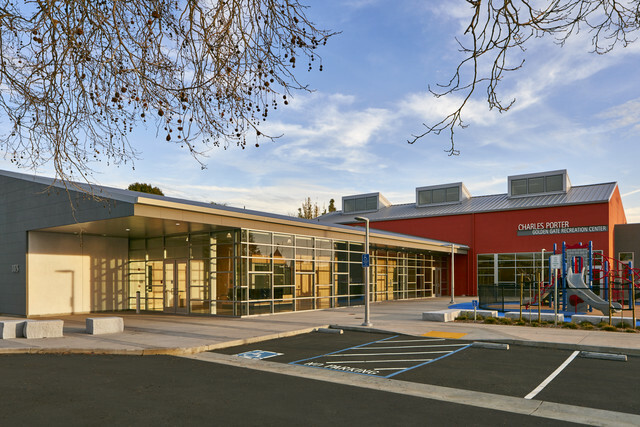 Councilmember Dan Kalb and his staff invite you to enjoy the afternoon at the newly constructed Charles Porter Golden Gate Recreation Center on 1075 62nd Street. The new facility includes a children's play area and a small field so please bring the whole family! This event presents a great opportunity to meet and chat with your neighbors. We will provide the main BBQ dish and drinks. Please bring a side dish or dessert to share. Parking is available on adjacent street. To see and share the flier please click here. Please join Councilmember Kalb and the Oakland Parks and Recreation Department for the exciting Grand Re-Opening of the Charles Porter Golden Gate Recreation Center. This exciting addition to District 1 is worth celebrating! The Grand Opening will include a facility tour, a basketball clinic, a Zumba dance in addition to the opening ceremony. Dan invites friends and neighbors to drop-by his booth for this year's Love Our Neighborhood Day. The event is a car-free festival with food, entertainment and children's activities. Where: Along San Pablo Ave. between Ashby Ave. and Stanford Ave.
Join Councilmember Kalb and the Mosswood Neighborhood Association for a morning of beautification and community building. Where: SGI Buddhist Center at 3834 Opal St.
Councilmember Dan Kalb invites you to attend a presentation by the City of Oakland’s Bureau of Planning and Oakland Public Works department, to review and comment on two City of Oakland efforts: the Local Hazard Mitigation Plan, and an update to the City’s Energy and Climate Action Plan. Every five years, FEMA requires local governments to update their Local Hazard Mitigation Plan (LHMP). The City of Oakland is currently updating its LHMP for the years 2016-2021. The LHMP will identify projects that could potentially reduce risks in the community from natural hazards (e.g., wildfire, floods, or earthquakes) and is designed to reduce the loss of life and property. To be most effective, a Hazard Mitigation Plan is prepared before a disaster occurs by identifying the hazards a community faces, assessing vulnerabilities to the hazards, and identifying specific actions that can be taken to reduce the risk. Oakland residents and business owners are invited to share their priorities on reducing the effects of natural hazards and risks, and to learn about the City’s ongoing climate adaptation efforts at a community meeting. The breadth of the natural and human-caused hazards being discussed ranges from earthquakes and landslides, to sea-level rise and hazardous materials release. The City is also reviewing its Energy and Climate Action Plan (ECAP) in 2016. The ECAP was written in 2010 through an unprecedented collaborative process between City staff and community members. Come hear from the Sustainable Oakland staff about the city’s progress in reducing greenhouse gas (GHG) emissions since 2005, and provide input into re-prioritizing the 175 action items originally included in the ECAP. To learn more about the Energy and Climate Action Plan, see the City’s webpage: http://www2.oaklandnet.com/Government/o/PWA/o/FE/s/SO/index.htm. Are you concerned about crime in your neighborhood? AC Transit is expanding service throughout the East Bay, however, some areas of District 1 may be compromised. Councilmembers Dan Kalb and Rebecca Kaplan invite you to join them in a discussion with AC Transit management and elected Board Member Greg Harper. Where: St. Columba Church at 6401 San Pablo Ave. This event is co-hosted with the Santa Fe Community Association and Neighbors, the Golden Gate Community Association and the Longfellow Community Association. We welcome and encourage your feedback, questions and recommendations. Please click here to see the flier. Please participate in a Dr. Martin Luther King Jr. Day of Service. Councilmember Kalb is sponsoring a Blood Drive at the North Oakland American Red Cross Center. Where: American Red Cross Center at 6230 Claremont Ave.
To RSVP to this event, please email Monica Harris, Community Liaison at mmharris@oaklandnet.com or call 510-238-7014. For information about eligibility please visit redcrossblood.org. Please view and share the flier here. As some of you know, Oakland is currently going through the process of updating its Pedestrian Master Plan. We would like to hear your thoughts and suggestions on how to make our city more attractive, safe and convenient for walking. Please join us at North Oakland Senior Center on Monday, November 2nd at 6:30 pm for a brief presentation of the process to develop the plan and open forum discussion about the future of Oakland’s pedestrian infrastructure. The presentation will be given by the City staff and the consultant. Please contact Olga Bolotina at obolotina@oaklandnet.com or 510-238-7240. At this Town Hall organized in collaboration with Alameda County Supervisor Keith Carson and East Bay Municipal Utility District (EBMUD) Directors Marguerite Young and Andy Katz, we are going to address one of the most pressing issues in our state – drought and water conservation. After a brief welcome from the hosts you will be able to talk with various representatives from the County of Alameda, the City of Oakland, EBMUD and other organizations who can provide you with valuable advice catered to your water bill and conservation opportunities and needs. Last two years were a lot of fun! Once again we are looking forward to providing great space for the District One community to connect in a casual and relaxing atmosphere in one of the most beautiful parks in Oakland. We already ordered good weather! Please join us and invite your neighbors and friends! Please see the vent flier here. Councilmembers will have challenging choices to make for the upcoming budget. If you have input regarding what you would like to see prioritized in the upcoming two-year budget, please e-mail Council District One office at oluby@oaklandnet.com with “15-17 City Budget” in the Subject line. In addition, you are invited to take part in Mayor Schaaf’s Budget Survey—the results of which will be shared with city councilmembers. District 1 Councilmember Dan Kalb, Mayor Libby Schaaf and Longfellow Community Association invite you to help clean the streets of North Oakland! We are going to meet at Grove-Shafter Park and from there proceed to clean the streets of Longfellow neighborhood. At the end of the clean-up, we will gather at the MLK Café to enjoy delicious food and beverages. Clean up tools will be provided. See you there! Please forward the flier for this event to anyone who may be interested. District 1 Town Hall – Oakland Working for You! Where: North Oakland Senior Center, 5714 Martin Luther King, Jr. Way. Please join us for a useful opportunity to meet and ask questions of City of Oakland service workers, including customer service representatives from Oakland Public Works, Code Enforcement, Building Permit Center, Human Services Aging/Senior programs, Oakland Animal Services, Renters Assistance Program other Housing Services, Emergency Services CORE program, and more! You will get the chance to speak face-to-face with key City of Oakland customer service representatives to ask your questions, learn about how key bureaus and offices function, and voice any suggestions you may have. Please spread the word and invite your neighbors to attend. All North Oakland residents are welcome. The United States Geological Survey estimates that of all Bay Area faults, the Hayward fault (which runs directly through Oakland) has the highest likelihood of a major earthquake in the next 30 years. An earthquake on Oakland’s Hayward fault is expected to be one hundred times stronger than the 1989 Loma Prieta quake and could cause billions of dollars in damage, as well as threatening the safety and lives of thousands of residents. In Oakland alone, 1,300 housing units in multi-family buildings were lost or severely damaged in Loma Prieta. These buildings were a significant affordable housing resource for elderly and minority residents. Without the needed precautions in place, the next big quake could be Oakland’s Hurricane Katrina. Twenty-two thousand (22,000) rental units in Oakland are in the type of building known as “soft story.” Soft story buildings are the primary type of structures that collapsed in the Loma Prieta and Northridge earthquakes. This is why tackling those precautions is of the utmost importance. Mayor Jean Quan, Councilmember Dan Kalb and City Staff will host a community forum to discuss efforts underway by the City of Oakland to design a “Safer Homes for Oakland” seismic retrofit program that reduces displacement and safety risks posed by “soft story” apartment buildings. Join us on Thursday, October 30th from 5:30 p.m. to 7:00 p.m. in City Hall - Hearing Room 1, to learn more and discuss Oakland’s seismic retrofit program. This event presents a great opportunity to meet and chat with your neighbors. Please feel free to invite your neighbors. We are looking forward to seeing you there! Town Hall with Mayor Jean Quan, OPDInterimChief Sean Whent, OUSD officials, Councilmember Kalb, and you. Residents, city staff, educators and community organizations will work together for comprehensive public safety, better opportunities for young people, and meaningful local jobs. Come also meet Captain Anthony Toribio, and your beat and problem-solving officers to deepen community partnerships for stronger neighborhoods. This event will include your input on strengthening community policing, and how the city can be a more effective partner with our public schools. Currently, the City Council draws its own district lines (and lines for the school board) every 10 years. There is a proposal in the works to give this power of redistricting to an independent commission of Oakland residents. Join us for an engaging evening to learn more and for you to share your thoughts on how it would work and how commissioners could be selected. Councilmember Dan Kalb is hosting this Town Hall to discuss community policing, neighborhood safety, and violence prevention programs. This meeting will be an opportunity for oyu to let city leaders know what you would like to see included in a fall ballot measure to enhance public safety. Starting in January, Councilmember Kalb will be hosting a town hall meeting roughly every other month on various topics that are relevant to District One residents. For our first town hall in 2014 we will be partnering with Assemblymember Nancy Skinner on the topic of Covered California and the Affordable Care Act. If you are uninsured, underinsured, or run a small business whose employees may need health insurance coverage, this town hall meeting is for you. People will be able to sign up for coverage on the spot. Please come out with any questions you might have regarding the state’s roll out of the Affordable Care Act. ***If you have recommendations as to topics for future town hall meetings, please contact our office. Beginning in January, Councilmember Kalb will be holding Town Hall gatherings approximately once every other month. The bi-monthly town hall meetings will be on local topics relevant to District One residents. These town halls will be created with the goal of providing educational opportunities to the public on important issues facing our city, as well as to facilitate conversation and gather opinions on how we could proceed going forward. Feel free to e-mail us with any ideas you may have for future town hall events. Our October Town Hall meeting is set for Saturday, October 26th from 10:00am–noon. We will be discussing the Wildfire Prevention District and Emergency Preparedness Training. Come to the College Prep School, 6100 Broadway, Oakland. Please spread the word and invite your neighbors. Please click here to see the flier for this event. We invite you to come together as a community and have a conversation about steps we are taking and can take to address the recent increase in burglaries, armed robberies, and other serious crimes in the Rockridge district. You’ll get a chance to talk with Oakland officials and Rockridge community leaders about implementing safety measures in our immediate Rockridge neighborhood and the City as a whole. Sunday, September 8, 3 - 5 p.m.
Beginning on Wednesday, July 10, the City of Oakland will host a series of Redistricting Town Hall Meetings to gather input from the community on boundary adjustments to Council Districts to equalize each district’s population according to U.S. Census data. The Oakland City Charter mandates the review of City Council District boundaries every 10 years. At its meeting on Tuesday, June 4, the Oakland City Council provided specific direction to City staff and established the criteria to be used in reviewing the Council District boundaries. (To view the reports, resolution and video of the meeting, please visit http://bit.ly/103avDM.) The public is invited to engage in the redistricting process through a series of Town Hall Meetings. Additional opportunities for input and feedback are also available. The Oakland City Council Districts also serve as the districts for the Governing Board for the Oakland Unified School District, commonly called the Board of Education. Any changes made to the Council Districts will also change the boundaries for the areas represented by the elected members of the Board of Education. However, boundary changes will not impact school enrollment choices. Redistricting Town Hall Meetings will be held in each of the seven Council Districts July through September. Oakland residents are encouraged to attend the meeting to learn more about the process and provide comment and input on District boundaries. Simultaneous interpretation in select languages will be provided as noted. In October, the City Council will begin holding public hearings to deliberate on the proposed redistricting maps that result from the summer’s Town Hall Meetings. The Council will make a final selection of the Council District boundaries in November. To assist in the Redistricting process, the City of Oakland has retained the services of National Demographics Corporation (NDC). NDC has extensive experience in redistricting, having served as consultants for local and regional redistricting efforts in Modesto, Los Angeles County and Santa Rosa. 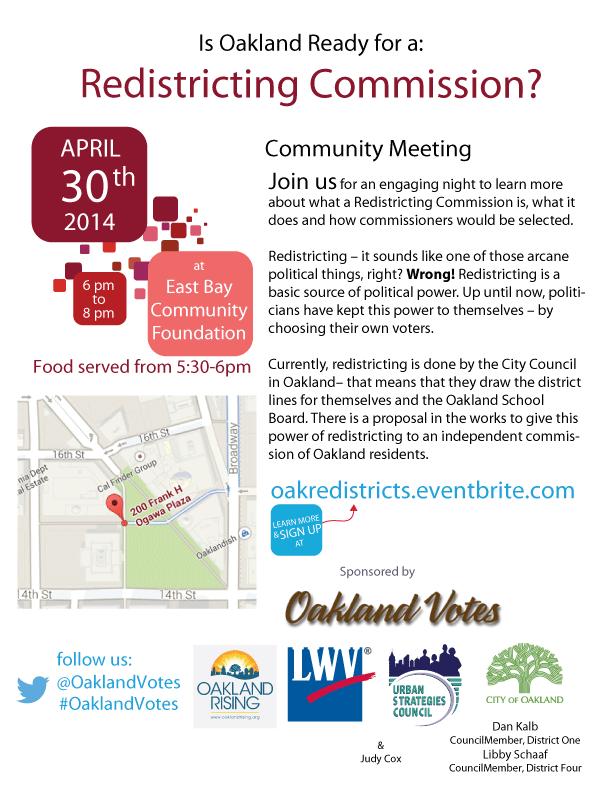 For more information on Oakland’s redistricting process including a map of current Council Districts, relevant legislation, upcoming Council meeting dates and more, the public should visit www.oaklandnet.com/redistricting. For more information, please contact Devan Reiff, AICP, Planner II, at dreiff@oaklandnet.com or (510) 238-3550. Councilmember Dan Kalb is hosting a public safety meeting to address the recent increase in burglaries, robberies, and other violent crimes in the Rockridge, Upper Rockridge, North Hills, Temescal, and Piedmont Avenue neighborhoods. Please join us to share your concerns, hear from Interim Deputy Chief David Downing, Police Captain for Police District 2 Anthony Toribio, and PSO Officers as to what they plan to do to address crime in our neighborhoods, and discuss how we can work together to make our neighborhoods safer. This is a great event to meet and chat with your neighbors. We will provide the main dish BBQ and drinks. Please bring a side dish or dessert to share. Parking is available in the lot for a small fee, or on Broadway Terrace. You can find additional parking on the north side of the park and walk a quarter mile around the lake to our picnic site. We are grateful to Oakland Firefighters (IAFF Local 55) for assisting with this community event. We are looking forward to seeing and talking to you soon!